Gamaya was founded on one principle: Connecting kids with culture. All over the world the tradition of storytelling, through simple stories, has been passed down through generations to teach values that enrich our lives. As parents we want our children to hear the same stories which inspired and entertained us when we were growing up. However, kids today are much harder to please. They demand highly engaging experiences! Gamaya’s unique blend of the real and virtual world brings folktales and stories of the past to life. Through 3D animated cartoons & toys that come alive in a video game, your kids will enjoy the world of folklore like never before. The Ramayana or any other popular epic for that matter comes with a passionate fan following who have a lot of expectations as to how these characters must look and feel. We take great care in designing these characters so they stay true to the legend, look unique and are cool for the next generation of kids to want to play with. We start with a description of what we want the character to look like, and then we create a concept drawing of this character. Once the concept resonates well with the personality of the character, we build the character in 3D. Then we 3D print the character to check if the physical toy is the right size, shape and looks good in the real world. This requires going back to the digital realm to adjust the design and repeat this process until we get the shapes right. Then our toy maker partners in Hong Kong do their magic in creating a steel injection mold from which we can produce the final toy which is then hand painted to recreate the intricate colors and designs. As a child Vn was inspired by the magical stories of characters and legends from his grandma. He wanted to work in the video games industry so he could one day recreate these stories for the next generation. Vn worked at Electronic Arts’ as a technical director and lead engineer for MySims. Prior to that, he worked at Capcom. He has over 20 years’ experience creating PC and console games. Doc started out being a dentist but his passion was always in creating original art. Doc’s concepts and images breathe life into our stories. Doc met Vn in a start up in India back in 1996. The two have worked together for over 15 years. Doc worked as a senior environment artist at TT Games in UK where he has worked on many Lego games including Indiana Jones, Batman and Star wars. He has over 18 years’ experience in the video games industry. Ted graduated from University of Illinois Urbana Champaign. He started at Capcom where he worked on Maximo and Final fight. He then moved on to Electronic Arts to work on MySims and as a key background systems engineer for Pogo.com, EA’s casual gaming portal. Along with his ability to architect robust gaming systems, Ted brings his knowledge of Japanese culture and folklore into the mix. He has over 14 years’ experience in the video games industry. 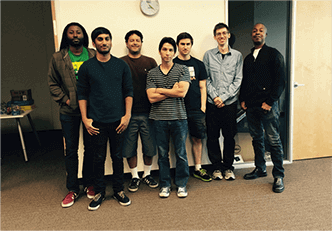 Our team in Sunnyvale, California. A very tightly knit and fun loving group with lots of experience in shipping AAA titles at Sony, Electronic Arts, Activision, Lucas Arts and Capcom. They are having a great time learning about world folklore and applying their design and creative skills to bring these stories alive. 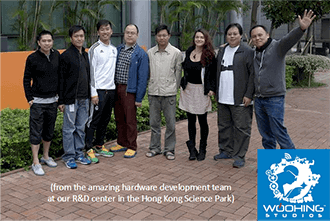 Headquartered in the Hong Kong Science Park, WOOHING STUDIOS LTD, our hardware development and manufacturing partner, has dedicated their best talents towards Gamaya's vision. Their experience and craftsmanship helps us deliver the most beautifully crafted toys our audience deserves.